Oum Qais was born in 1925, the third child of nine siblings. 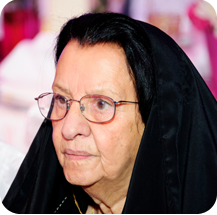 As far as one can remember, Oum Qais has always been involved in some kind of charity work and her dedication to helping people is well known in Kuwait. It was certainly engrained in her since childhood, when aiding the less fortunate was a way of life, and supporting the poor was a natural response to the deeply rooted religious beliefs of the society in which she lived, first within her family, and later in her husband's family. Both merchant families were very generous and provided donations to various causes in the Kuwait community, and also various communities in the Arab world.